Ich habe wieder einmal Post bekommen und mich geärgert. Post von der Räucherkate, die in einem Postfach in Quakenbrück sitzt. Noch nicht einmal die Anrede habe sie hinbekommen, dafür aber andere Dinge ziemlich unverschämt gut formuliert, so dass man man denkt, man bekäme etwas geschenkt, aber man nicht sieht, dass man bezahlt. Gut zu wissen, dass es nichts gratis gibt. Gehen wir den Brief einmal durch. Anstatt einer Anschrift im Adressfeld liest man: VIP-Einladung – Bitte sofort öffnen. Was soll denn das für VIP (very important person) sein? Als Dankeschön für die Teilnahme an der Kaffeefahrt wird mir das Angebot gemacht, einen Fernseher zu erwerben. Da könnte ich auch in den Fachhandel gehen und mir direkt mehrere Angebote machen lassen. Danach wird mir angeboten, etwas „kostenlos“ mitzunehmen . Doch halt! „Achtung große Bio-Werbung! Kostenlos für jeden Gast zum mitnehmen“ – ja, man darf die Werbung kostenlos mitnehmen. Für die Butter, Räucherfisch etc. muss man natürlich bezahlen. Und Ehepaare dürfen sogar die doppelte Menge kaufen – Danke, Räucherkate! Außerdem dürfen Ehepaare auch einen „hochwertigen Kaffee-Express-Automaten“ erwerben. Ich soll dann 800 € gewonnen haben. Wenn man aber aufmerksam liest, dann habe ich den Sonderpreis gewonnen und das kann etwas ganz anderes sein. Es steht auch nicht da, dass die Glücksnummer und der Gewinn von € 800 ein und dasselbe sind. Es ist von einem „reichhaltigen Frühstücksbuffet“ und „schmackhaften Mittagessen“ die Rede – da nicht dabei steht, dass es kostenlos ist, wird man dafür auch bezahlen müssen. Alles in Allem: so sieht Abzocke aus! Ich fahre nicht mit und das rate ich auch jedem, der solche Post bekommt. „Wir sind die einzige Behörde in Deutschland, die im Internet eine Warnliste betreibt, mit deren Hilfe vor unseriösen Werbefahrten ("Kaffeefahrten") und Werbeverkaufsveranstaltungen gewarnt wird. Wir möchten insbesondere ältere Menschen so direkt und indirekt vor betrügerischen Praktiken schützen, die auf solchen Veranstaltung üblich sind. In dieser Liste findet sich die Räuccherkate. Und wieder habe ich Post erhalten! Wenn man sich nun das Anschreiben der "Hofkäserei" genauer anschaut, wird man die Parallelen zur Räucherkate schnell entdecken. Alles derselbe Käse! Die Abzocke geht also weiter. Und ich rate allen, die auch so ein Anschreiben bekommen haben, tun Sie es mir nach und fahren nicht mit! Die Räucherkate hat sich wieder einmal gemeldet: "Ihrer letzten persönlichen Einladung sind Sie ja leider nicht nachgekommen. Da wir fest mit Ihnen gerechnet hatten, haben wir dementsprechend riesigen logistischen Aufwand betrieben, ausreichend Geschenke einzukaufen." Und man will mich das letzte Mal eingeladen haben. Glaube ich einfach nicht! Das letzte Mal sollte ich die Antwortkarte an ein Postfach in Bremen schicken, jetzt ist ein Postfach in 28094 Walle benannt worden. Ich verstehe nicht, dass dies ohne Eingreifen der Behörden möglich ist. Bitte warnen Sie Ihre Eltern und Großeltern! While looking at my pictures from the trip through Central Asia, I was thinking about the many forms of burials and honouring the dead that I had seen. There were burial mounds, all kinds of graves, sarcophagus, mausoleums, and even more, if you differentiate between certain kind of burial practices. One form is the second burial; after decomposition the bones are put into an ossuarium or small bone coffins. Burial mound are typical for the Neolithic Period and Early Bronze Age; I was able to see some kurgans. And the balbals, and so on. 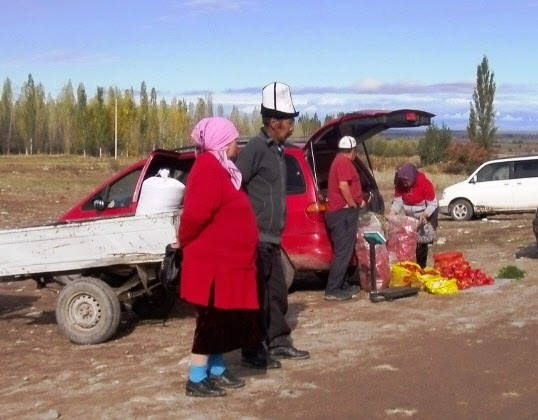 My first encounter has been watching the pilrims at Seyit Jamal Addin in Anau, Turkmenistan. 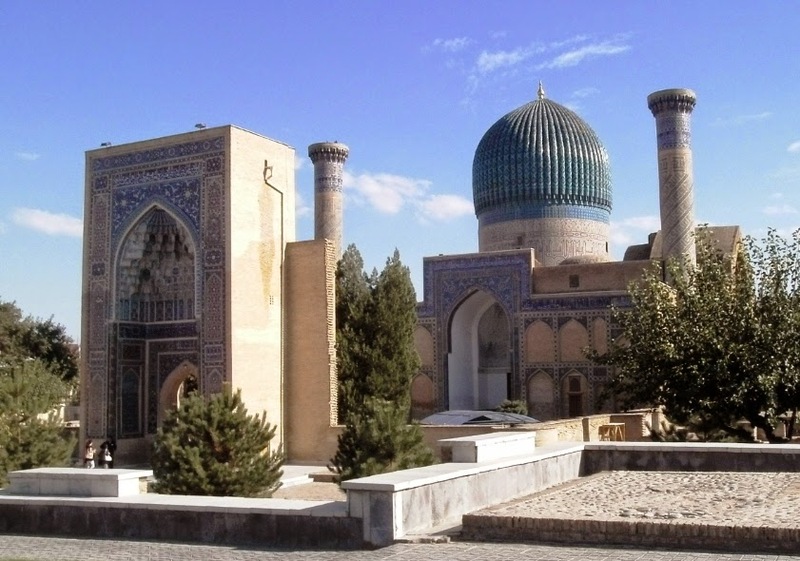 In Khiva I've visited the Sayid Alauddin Mausoleum, which is small and unobtrusive. It dates back to 1310. The tiles of the sarcophagus are of the 19th century. There is an imam praying on request, who alwqays overlooks the scene, but still people throw money into the closed area for good fortune, which they shouldn't do. The imam prays or better recites verses from the quran over the bread, which is supposed to absorb the good energy and is eaten later. As I have seen quite a lot of mausoleums, I won't show all of them. But it would be a shame not to mention the Ismail Samani Mausoleum. 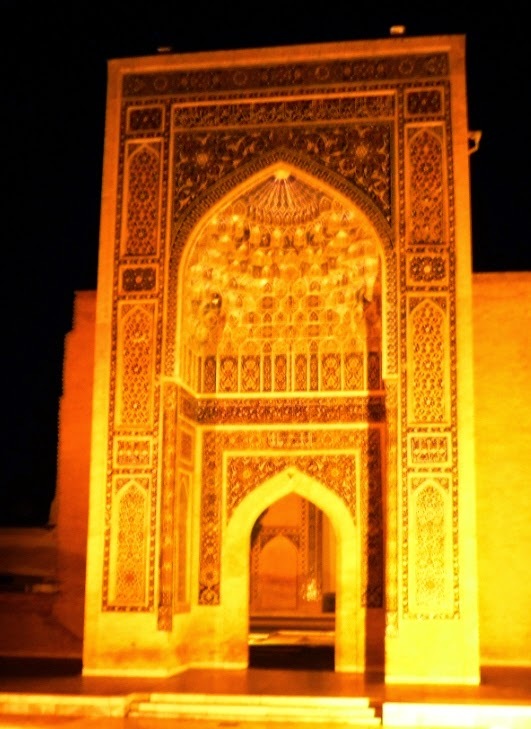 It is the oldest building of Bukhara, having been erected in 905. It is made of terracotta and the walls two meters thick at the base. 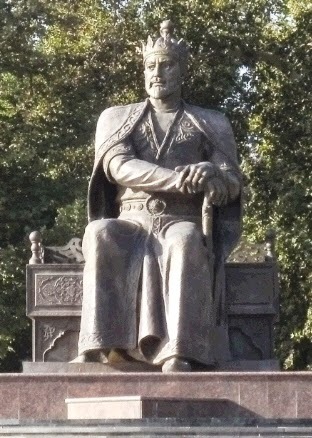 Ismail Samani was the founder of the Samanid dynasty (AD 819-999), who reigned from 892-907. This form of mausoleum is also called türbe. Its' architecture recalls the Zoroastrian fire temple or chanar taq. 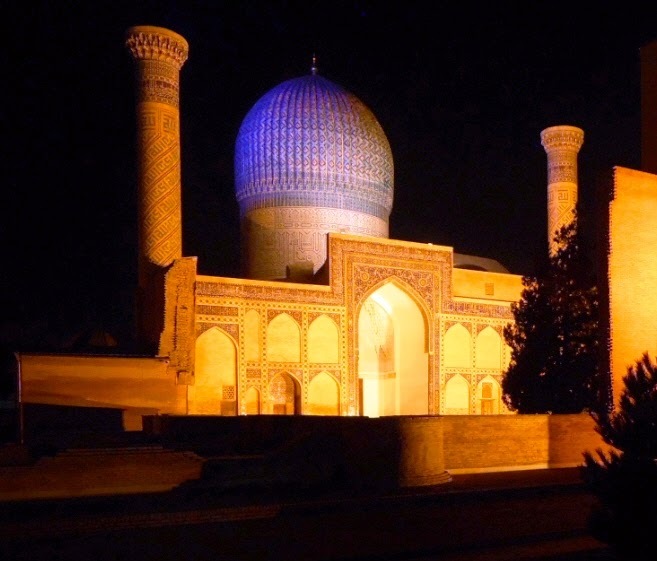 Samarkand has the Shah-i-Zinda, the avenue of mausoleums. It would be worth while to linger on the the different mausoleums as there are lots of stories concerned. I couldn't refrain from taking this lady's picture, who seems to have found the right dress matching the tiles. 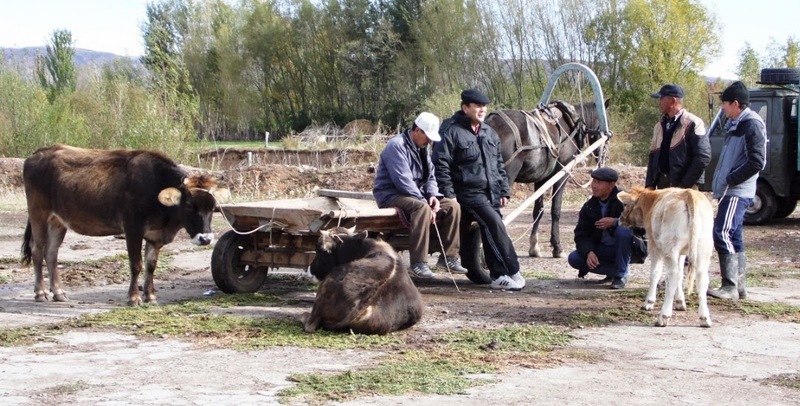 And now to something completely different - a cemetry of a German community in Kyrgyzstan. The community used to be Mennonites, but joint the Baptists as the number of people was dwindling after they were allowed to move to Germany. 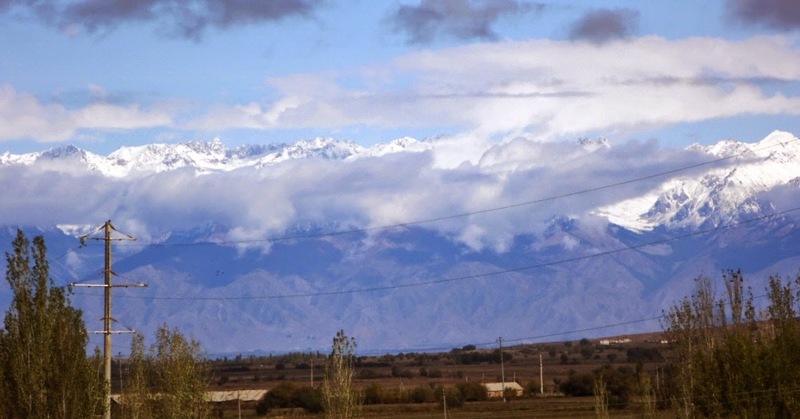 Near the Burana tower in Kyrgyzstan (near the small town Tokmok) one can look at the field covered with balbals, totem-like stone markers of graves. Balbal means grandfather or father. These balbals were made around the 6th to 10th century. In the museum one can see terracotta coffins for bones, also called ossuaries. The Sogsians also had a word for ossuary: tanbar. After decomposition the bones were places in the ossuary and then stored or disinterred. I also could a mordern graveyard along the road to Karakol at Issyk Kol. You can see more elaborated tombs and yurt-like structures. Tombs are thought to house and protect the dead.You can also see the influence of shamanism despite Islam being the acccepted religion. 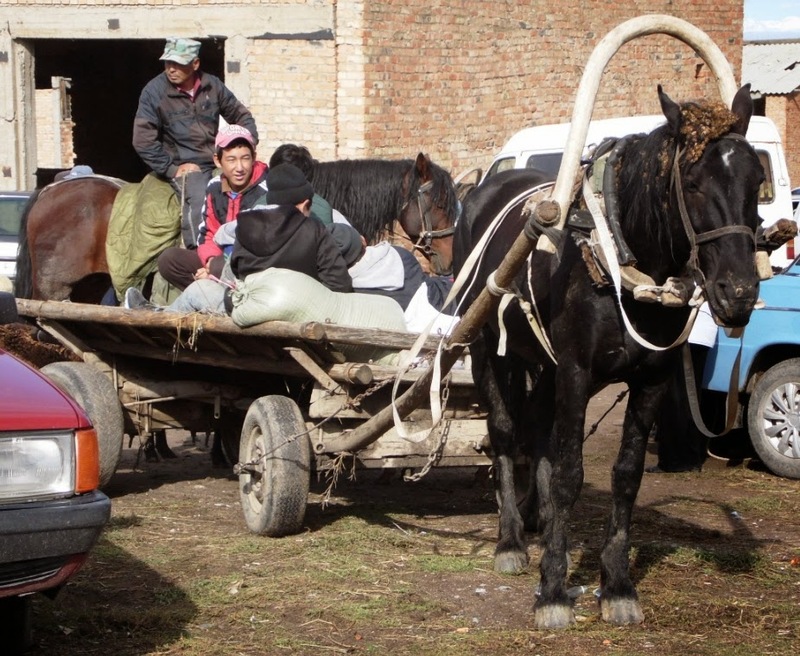 Shamans still play an important role in the rural/seminomatic communities. 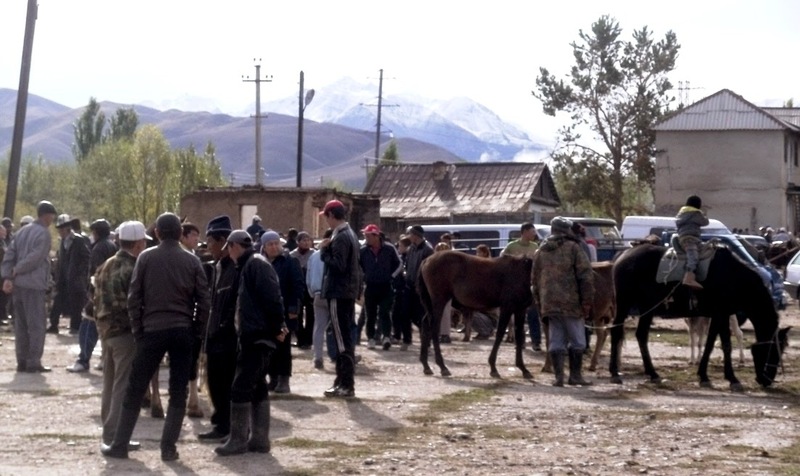 Another gave - the star points to military. Further along the road I was able to see a kurgan in a lonely region. The Kurgans were a seminomadic pastoralist culture, who buried their dead in deep shafts within artificial burial mounds, also called barrows. At Tamgaly in Kazakhstan I saw the typical graves, where people have been buried in the fetal position. Gur-e Amir is the mausoleum of Tamerlane (Timur), who had conquered a vast empire, stretching from today’s Pakistan to Turkey/Armenia. He was the grandson of Ulugh Beg. 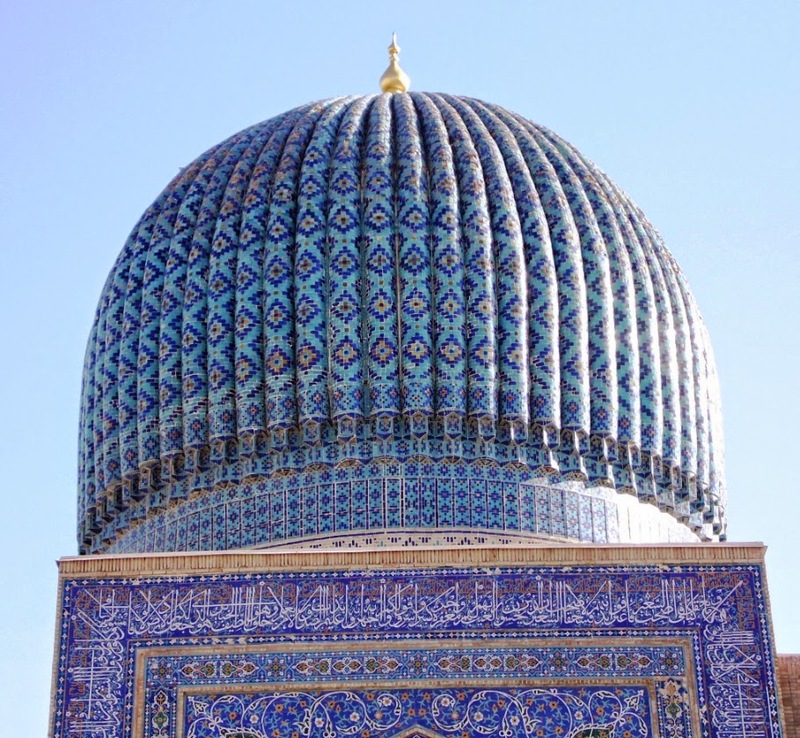 In Samarkand you can visit the mausoleum, where he is buried. The mausoleum, in which he wanted to be buried, is in Shakhrsabz, however. He lived in the 14/15th century. In 1941 the crypt had been opened and the remains had been excavated and studied in Moscow, but had been returned later to the mausoleum. 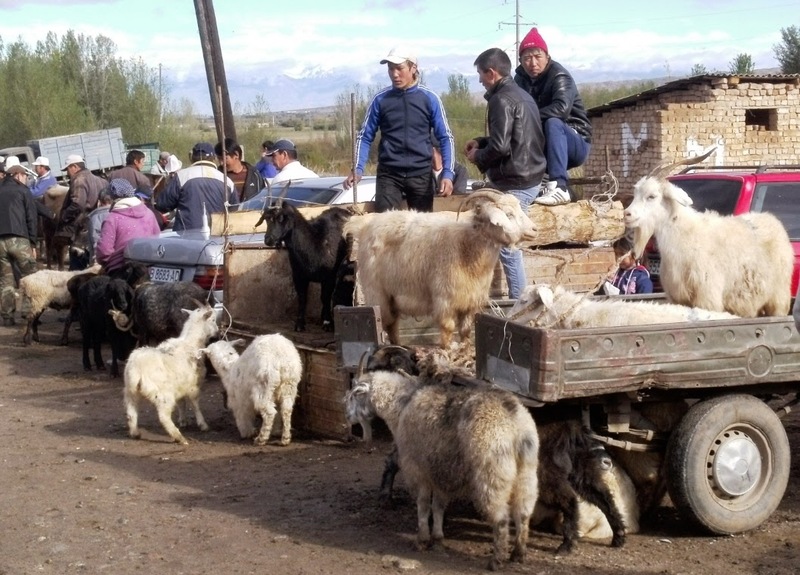 A couple of weeks ago I’ve written about Kashgar and also included two pictures of the live stock market there; link: http://rheumatologe.blogspot.de/2014/09/kashgar-xinjiang.html. 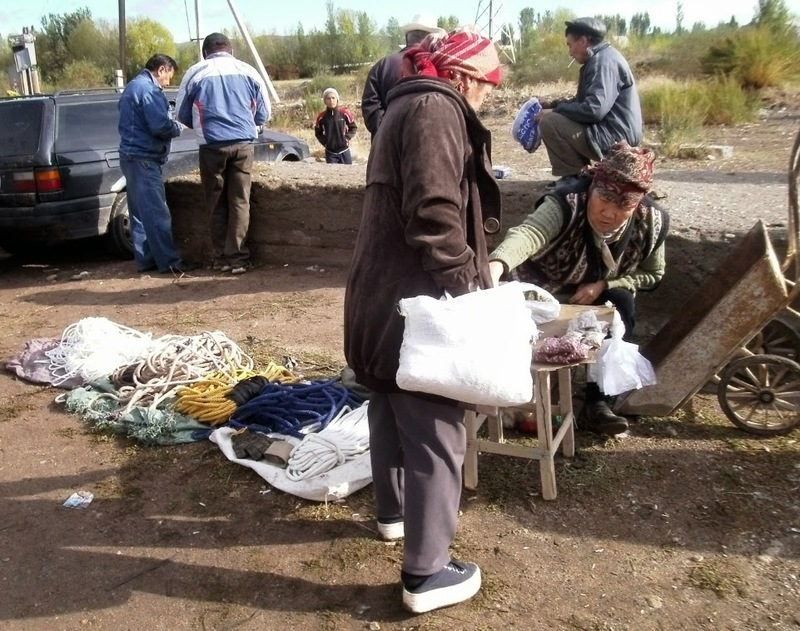 In Kyrgyzstan I was able to venture into a small twown with an animal market at Issyk Kul (Yssykköl), a large lake at the Tian Shan (length 182 km, width 60 km). 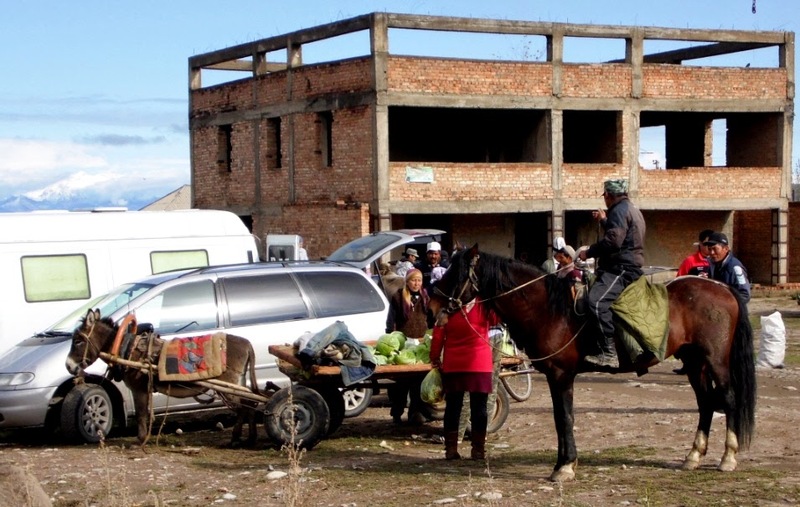 The market is located at the old kolkhoz buildings.